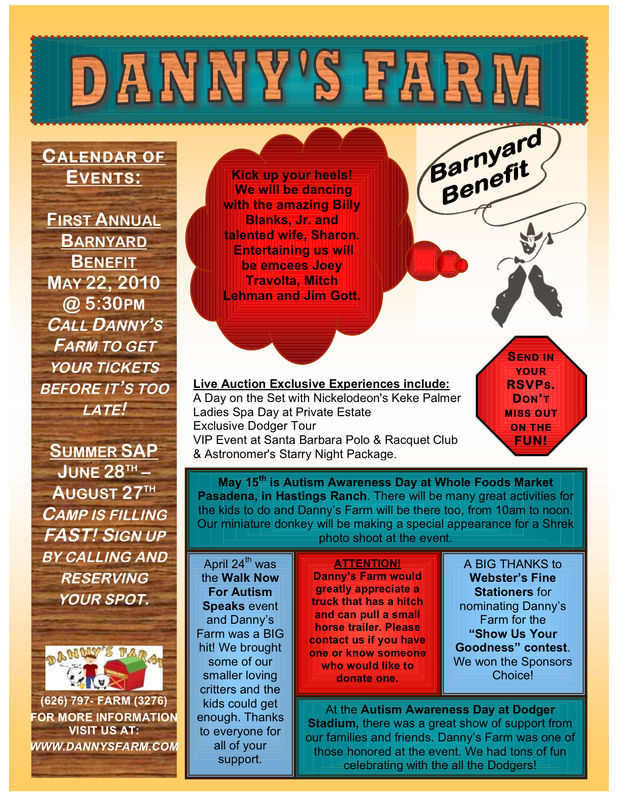 Danny's Farm, a local treasure for children of all abilities, is holding a "Barnyard Benefit" next Sat., May 22, with a silent auction. Among the entertainment will be Billy Blanks, Jr. (who is a dancer, and son of the Tai Bo guy) and Joey Travolta (ask him if his brother is still flying low over Altadena). Among the auction items will be a day at the Nickelodeon set with Altadena actress Keke Palmer (Akela and the Bee). Danny's Farm recently received $1,000 from Riceworks Rice Crisps as a "Sponsor's Choice" cause in the "Show Us Your Goodness" contest. Danny's was nominated by Altadenablog sponsor Webster's Fine Stationers.